Shaleen Surtie-Richards is a South African actress best known for her title role in the 1988 feature film Fiela se Kind (Fiela's Child), and as Ester (Nenna) Willemse in the M-Net soap opera Egoli: Place Of Gold. She was also a judge on the reality competition television series Supersterre from 2006-2010. Shaleen was born in Upington on 7 May 1955 and schooled both there and in Cape Town. Qualifying as a kindergarden teacher, she taught in both cities between 1974 and 1984. Shaleen took many roles in several amateur stage productions between 1974 and 1981 and was also active in productions of the Department of Education’s Theatre-in-Education from 1982 - 1984. She became a professional actress in 1984 and has become very well-known through her appearances on stage, television and films. Her stage work over the last 30 years includes productions by some of the country’s leading directors. She has been seen on stage in all the main centers of the country, as well as London, and has participated in both the Grahamstown and Edinburgh Festivals. Her many TV appearances include single dramas and series, as well as a program presenter. She ahs had recurring roles on two other South African soapies, Generations (2001-2004) and 7de Laan (2002). She also works on radio as narrator or actress. 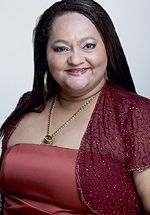 She has appeared in the South African films Nag van die 19de (1992) and Leon Schuster's Mama Jack (2005), in which she played the role of the Mayoress.